About ¼ of our patient base is of adult age, and one of the particular treatments we offer our patients 18 years and over is adult braces. It’s never too late to give yourself the gift of the smile you’ve always wanted. Adult braces work just like any other type of braces. Read on for a few things you should know if you’re an adult considering whether or not you should get braces. By and large, orthodontic treatments have the purpose of improving a smile’s appearance, but also to improve its functionality. When our teeth continue to shift as we approach middle age, it can change the way we speak. As we get older, think of getting braces as a corrective measure that will act as an investment in your teeth, mouth, and bite that will help set you up for great oral health in the future. Sure, the most common fear of getting adult braces is having to walk around with the “mouth full of metal” look. But the truth is that even traditional metal braces are far more discreet that they’ve ever been. We also offer accelerated braces, which reduces the time you’ll have your orthodontics, not to mention Invisalign, which will be one of the most discreet options. Since our patients who get adult braces are adult age, chances are they’ll be more likely to follow their orthodontist’s direction. After all, it’s their own choice to get them in the first place — no Mom or Dad forcing them to get them for the sake of their oral health. We consult with our patients who are considering getting adult braces on a case by case basis, carefully assessing aesthetic goals, coming up with a custom-tailored treatment plan that will be best for you. 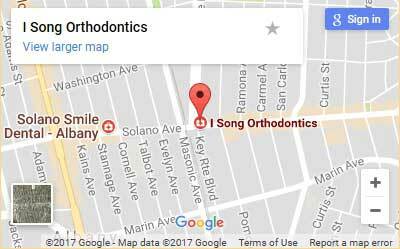 Whether it’s Invisalign, accelerated braces, traditional metal braces, or ceramic braces, I Song Orthodontics will give you the comprehensive treatment you need to experience the results you want. Contact us today for an adult braces consultation.